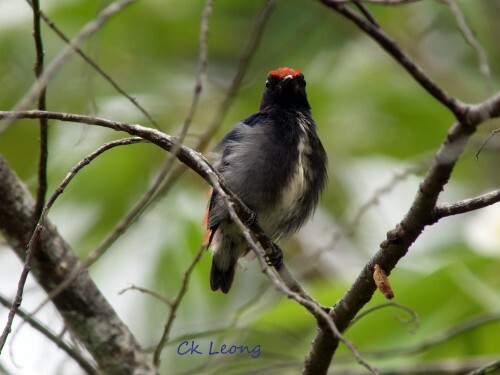 Here’s another common flowerpecker found in gardens and secondary forest. 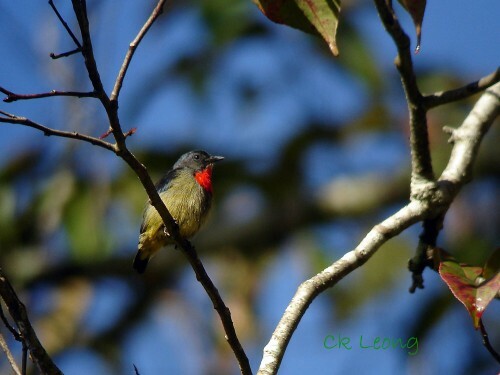 The Scarlet-backed Flowerpecker Dicaeum cruentatum is really appropriately named, the male flashing its brilliant colours at every opportunity. Different colour morphs have been reported, with this particular individual showing a much narrower white on the belly. Despite it being mentioned as common in various publications, I have not been able to spot the Yellow-breasted Flowerpecker frequently. When I do, it is usually low down on a flowering plant. I really enjoy looking for its orange-red patch on the crown which I thought adds class to an already beautiful bird. 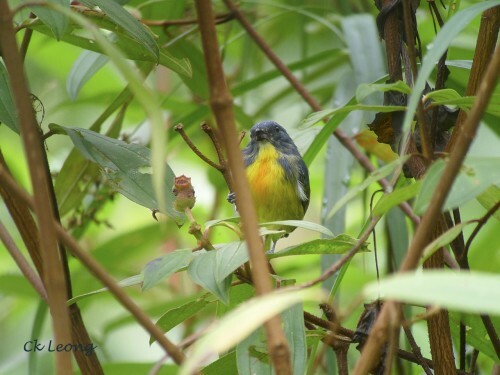 Here’s a favourite bird of mine, the Yellow-rumped Flowerpecker Prionochilus xanthopygius. This species is more common in forest edges and secondary growth. 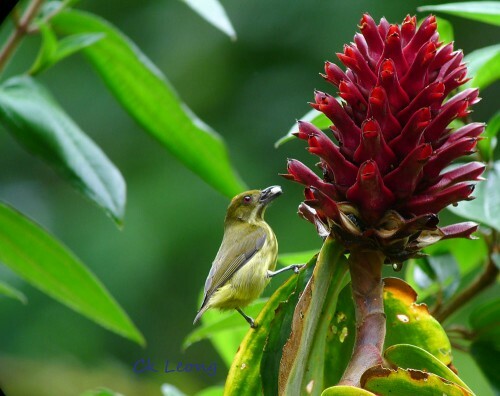 As with other flowerpeckers, it is small, always active and darts around in all levels of the forest. A Bornean endemic. The Black-sided Flowerpecker Dicaeum monticolum is one of 2 endemic flowerpeckers in Borneo. It is a common montane species and can be seen easily in Mt Kinabalu and other mountain ranges. Around Kinabalu Park Headquarters, it is often seen feeding on the ripe berries of the Pink Medinella. When in flight, it announces itself with a series of metallic zit calls. 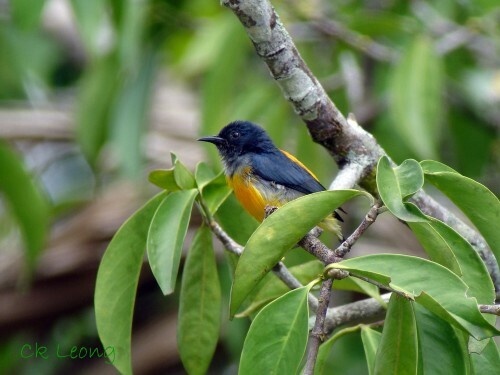 Back to the cinnamon trees again, this time it is the Orange-bellied Flowerpecker Dicaeum trigonostigma flying in, snatching a single cinnamon fruit, and out again as fast as you can say Hi! This is one of my favourite garden birds and I am sure of many proud gardeners around the Greater Sundas. Its call is loud and its colours even louder!